Following significant changes to American’s award chart in 2016, sweet spots within AAdvantage have become harder to find. Similar to recent overhauls of Delta and United, the 2016 changes saw American raise the number of miles required across a large number of destinations while reducing a few awards with modest decreases. The adjustments to American's award chart and a switch to revenue based earning across American and partner airlines has made it harder to extract top value from AA miles. The silver lining is that American remains a founding member of oneworld® alliance, providing AAdvantage members access to fantastic partner airlines that offer superior hard products and access to every region of the world. American offers many ways to earn AAdvantage Miles. Members can earn miles on flights and related purchases, via spending and signup bonuses on co-branded credit cards, promotions, at hotel partners, the AAdvantage mall and much more. 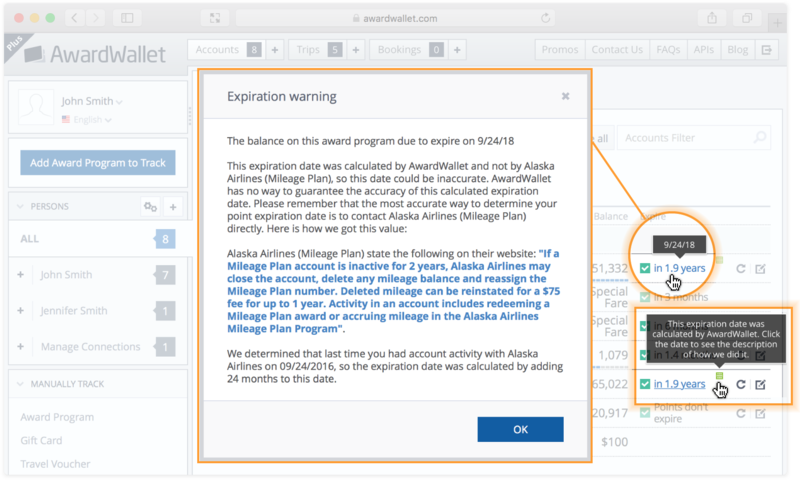 The fastest way of building a usable balance of AAdvantage miles is to leverage the AA co-branded credit cards offered by Citi and Barclaycard. Much like the Hilton co-branded cards provided by Citi and Amex, having a Citi AA card doesn’t prevent you from acquiring the Barclays AA cards, opening up earning potential not found in many other programs. Taking advantage of the limited-time offer on the AA Executive Card, you could earn 75,000 bonus miles after spending $7,500 in the first three months, and then double down by acquiring the Aviator Red, which offers 60,000 points when you make the first purchase inside three months. This would net you 135K AAdvantage Miles, an amazing haul. An alternative to the Citi and Barclays options is via Marriott Bonvoy. Points transfer from Marriott to American at a 3:1 ratio, so you can transfer points earned via cards that earn Marriott Bonvoy points like the Starwood Preferred Guest® Credit Card from American Express or the Marriott Bonvoy Business™ American Express® Card. Unfortunately, Marriott is the only flexible rewards currency that transfers to American while maintaining any tangible value. Reduced Mileage Awards are one of the best benefits of holding an eligible AAdvantage co-branded card, providing access to discounted round-trip or one-way travel on MileSAAver® awards to select destinations every other month. Reduced Mileage Awards can provide discounts of up to 7,500-mile round trip or 3,750 one-way on MileSAAver awards greater than 500 miles. One-way awards under 500 miles can be eligible for a discount of 1,000 miles. The discounts are dependent on the card you hold and the route flown. You can find a complete list of destinations and all the details on the Reduced Mileage Awards page of American’s website. One of our favorite AA redemptions is flying Qantas to Australia and New Zealand. Qantas operates non-stop flights from Los Angeles and San Fransisco to Sydney with one-way awards pricing at 110,000 miles in first, 80,000 in business, and economy awards priced at 40,000 miles. Qantas offers a fantastic premium class product and top-notch service to boot. Tip: When searching for Qantas award availability, you can use AA.com, but be sure to select an origin and destination that Qantas serves non-stop. It'll help you quickly identify what your options are when it comes to flying Qantas. Following the changes to American’s award chart, this is one of the best sweet spots still available. You can fly first class on oneworld® partners Qatar and Cathay Pacific, and also on Etihad between the Middle East and Asia Regions 1 + 2 for 50K miles one-way. All three airlines offer standout first-class products, and although Cathay has clamped down on releasing first class award availability to partners, there is still space to be found if you put in the legwork. 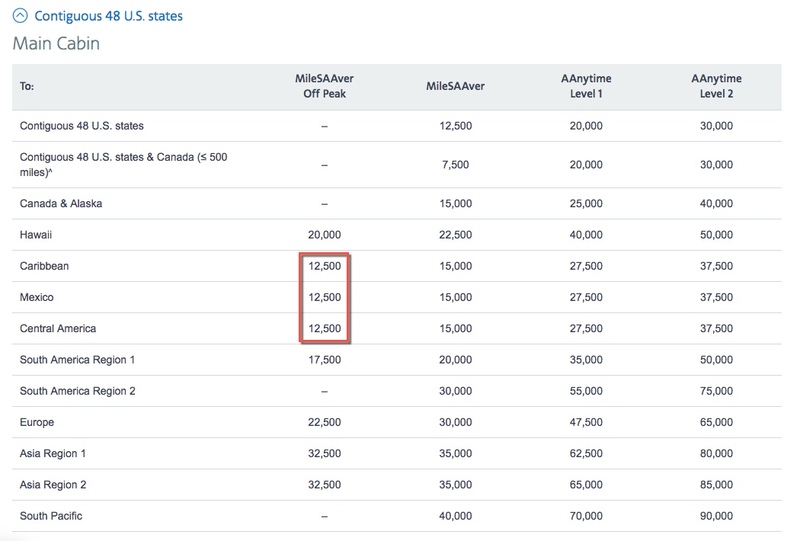 One of the few award sweet spots to come out of AA's 2016 award chart changes, MileSAAver rates from the lower 48 states to the Caribbean, Mexico, and Central America dropped from 17,500 miles in economy to 15,000, with off-peak dropping to 12,500 miles one-way. These are fantastic fares. Flying roundtrip to the Caribbean for 25K is a great price and opens up options for a quick romantic getaway for 2 to the tropics for 50,000 American miles. While these are not going to be the most popular flights for many frequent flyers, hops under 500 miles on American cost only 7,500 AA miles. These shorter flights provide an economical way of jumping to your local gateway airport if you aren’t based near an AA hub, and also for those travelers that don’t like driving distances. Perfect for repositioning flights. Reduced Mileage Awards for eligible AA co-branded cardholders can wipe another 1,000 miles off these awards. While not available using AA miles, this option is one we consider a sweet spot in AAdvantage due to the guaranteed value it provides. Note that Amex recently dropped this benefit from 50% to 35% and introduced a points cap of 500K per year. See our breakdown of the changes for all the details. One of the perks of The Business Platinum® Card from American Express is the 35% points back when using Membership Rewards Pay with Points for First and Business Class tickets through American Express Travel, or on any class ticket with your selected airline. American is one of the airline's cardholders can choose as their designated carrier with Amex, and the points rebate means you can extract top value even on economy fares. Don't forget, you're eligible to earn award and elite qualification miles for these tickets! 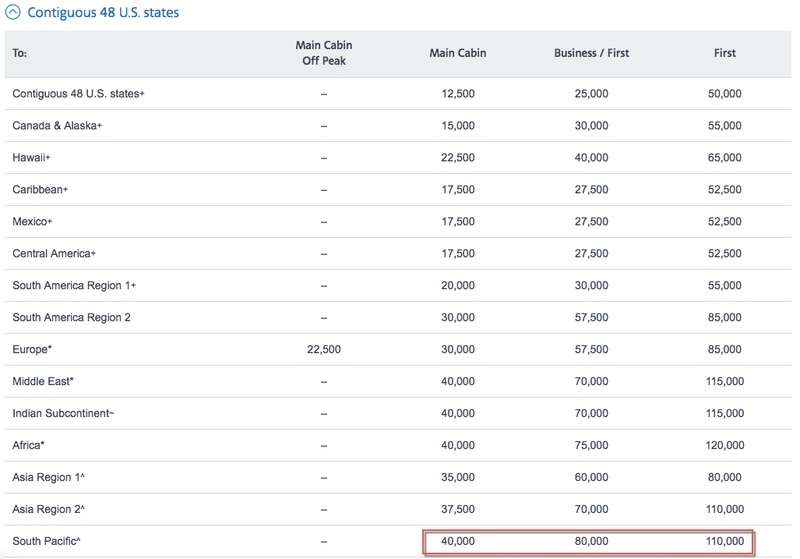 There are some fees to be aware of when booking award tickets on American. Phone bookings taken by the AA reservation line that can be booked online will come with a $30 fee for domestic travel and a $40 fee for international flights. It is often possible to have these fees waived if you ask nicely, and if the award cannot be booked on AA.com, be sure to inform the rep that the fees shouldn’t apply. These fees are waived for Executive Platinum members. American charges a close-in booking fee of $75 for awards booked within 21 days of departure, and these fees are also applied to ticketing changes inside that 21-day window. Fees are waived for Executive Platinum, Platinum, and Gold members using miles from their account. While extracting maximum value from American awards is not as easy as it used to be, there is still good value to be found, mainly when flying American to Central and South America, and when flying partners in the South Pacific, Middle East, and Asia. Holding a card like the Citi® / AAdvantage® Executive World Elite™ MasterCard® is a great way of compounding the value in AAdvantage, providing access to benefits like Reduced Mileage Awards which can save you thousands of points. It is also worth investigating transfers from Marriott. You gain an instant 25% in bonus points when transferring Marriott points in chunks of 60,000. One thing about Marriott points that you shouldn't forget is that you can transfer points to other members of your household at no cost — a great way to allow them to transfer points into their AA account if needed. If you have a favorite AAdvantage redemption we’ve missed, let us know in the comments! If you need a hand with a booking, reach out to our award booking experts. good luck with Qantas tickets. Almost impossible to find lately. The Caribbean deal is very reasonable. I find it to be one of the best values quite often. Still I believe that SPG and Marriott Rewards points post-merger are way more valuable than AA miles with their inferior redemption options, close-in fees, etc. Thanks for this. Trying to plan a trip to hawaii from the midwest and I think American will be the best play. Great post and good to know there are still some sweet spots left in the AA program. There are sweet spots for AA miles? They actually open up awards? Sweet spots as in you’ll get excellent value from your miles. While in some cases, such as Qantas, award space can be tough to come by, that isn’t always the case. I find it hard to find any business class seats available going to Asia. Unfortunately, two of AA’s partners: Cathay Pacific and Japan Airlines aren’t shown at AA.com when you search for award seats. Your best bet is actually to search on BA.com for these flights. If you find a seat with either airline listed on BA.com, you can call up and request AA book you. 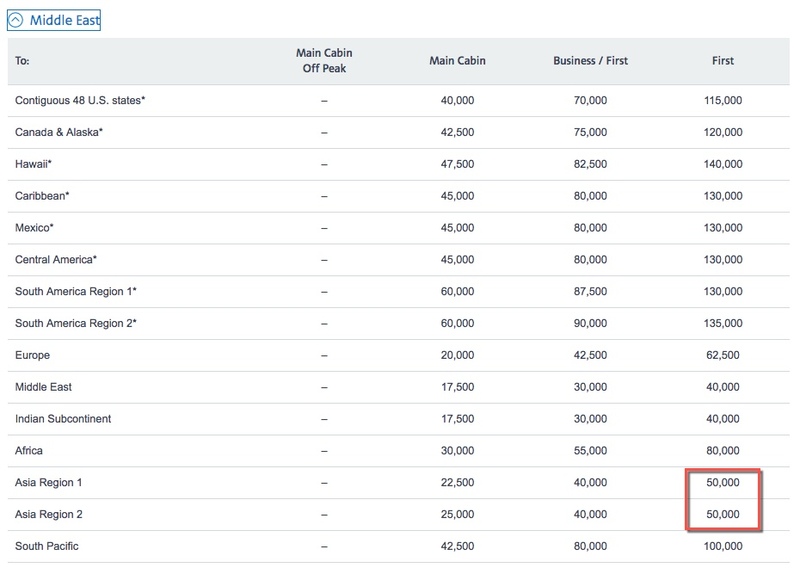 The seats shown at BA.com for partners Cathay Pacific and Japan Airlines are available to all of their partners. That is amongst the most frustrating things with collecting airline miles, that seats are available to book but you can’t see them when you search. It is good to know that in this case there is a workaround of using BA to search. Another good source to check Japan Airline availability is Alaska Airline website. The key to getting these is booking them 331 days out when you can first book the fares. They typically get booked up instantly. I’ve found that’s not always true. If the flights aren’t terribly booked they release more discount seats closer to the time of flight. AA awards are incredibly hard to find. It seems that they just do not release enough of them. It took a good few weeks to snagging the award space luckily twice at 2 LAX-PPT tickets using AA awards. Should also consider the 10% upto 10K miles that you get back as a AA Citi cardholder which makes some of these awards even better! I have been really lucky with reduced domestic awards throughout this past year. As long as you stay out of the busy holiday travel season, you can do great. It took only 15,000 miles to get to RDU and ROC (round trip) this year. It was one of the first times I felt good about using miles (tickets were over $500 in each instance). Look hard and shop smart and you can get good bang for you buck sometimes! Good info as I’ve started to rack up AA miles and haven’t used any yet. I didn’t know about the Barclay AA Business – how do I apply for it? Didn’t see anywhere to actually get it. Currently, they are not accepting new applicants. Having just moved to PHX where AA has had a large presence since their merger with USAirways, I really appreciate the info in this post. Regarding award tickets on Cathay using AA miles – 3 years in a row I’ve been able to book business class tickets from JFK to SE Asia, for pretty much the exact dates that I wanted, by calling AA’s main reservation number. To each his own, but for me that has been the simplest way. What I like also is being able to speak to a person from the outset, and in my experience the AA reps try their best to find what you need, including dates, times of day, connection times. If you get the right agent, they’re the best resource. Just need to get someone willing do do a little work for you. Glad to hear it has worked out! Using the SPG and Marriot deals currently. I will need to looknintobtje discounts for the Carribean and I was unaware of the extra fees when you call instead of booking online. Thanks for the info! Great post! I also find 22.5k flights to Europe (off-peak) to be a good deal. Certainly if you’re only travelling one-way. Although 20k AS mikes with an optional stopover is IMO an even better deal, AA is a strong back-up. 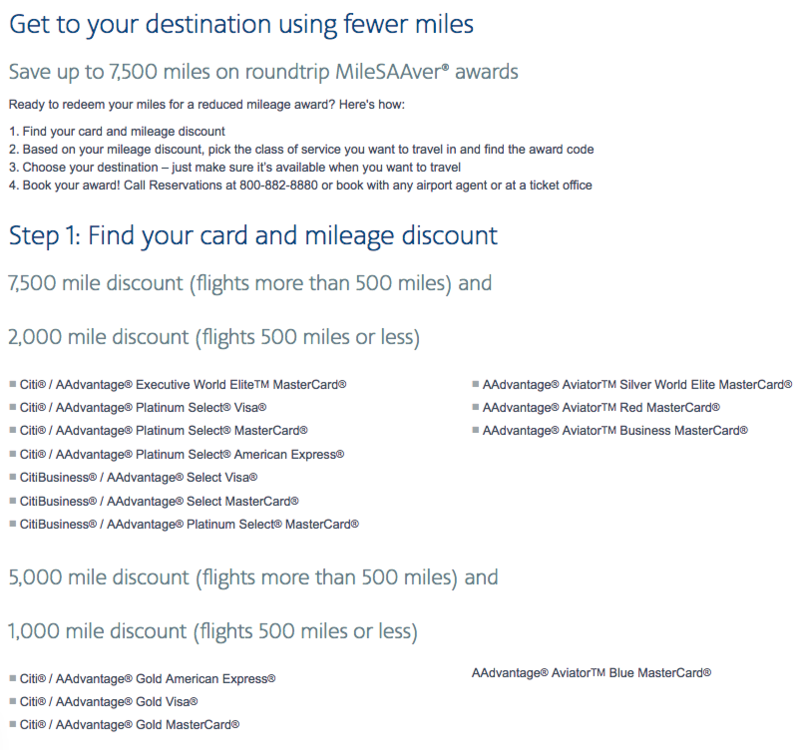 I have been trying to find two business saver awards for late Fall from LAX to SYD using my AA miles without success. Perfect! I’ve been sitting on some of AA miles that I’ll look forward to using! Yes! Every time I look at using my miles for an award, they only offer some horrible options that take twice as long. American Airlines is bad when it comes to booking flights to Europe. The lowest award seats are usually on British Airways that always have alot of British Taxes and fuel surcharges added out of LHR. I recently booked a one way flight from LHR to SLC for 57K miles business class and the taxes were over $500. If I could have found an American flight it would have only been $175. Be careful booking on a BA award. I find trying to use the various steps to book with AA miles on non-AA airlines to Asia intimidating and daunting. My goal is to pull that off once somehow. But there is still an out of pocket cost to book all these award flights. How do we find out how much the dollar portion of a supposed award ticket would cost to the various international locations. If those fees are significant, it may not be worth going through the hassle of trying to use AA miles to book those kinds of flights. Just avoid BA — the taxes/fees are otherwise quite reasonable and not that much. You can call and AA will always give you prices/costs as well. The 22.5k TATL awards are my favourite. This is very helpful; specifically the Middle East sweet spot – thank you! Perfect timing on this article as I’ve got a boatload of AA miles to burn through! Been trying to use points to travel to Costa Rica, and cannot seem to get it figured out. Appreciate this post! The cheapest way is to use Southwest. You can transfer Ultimate Rewards or Starwood. Always good availability. Also, Delta seems to be reasonable on that reward. I got 2 one ways for 17,500 each. I’ll be returning on SW. I checked AA, but it was more points for my routing. I find that the AAdvantage programme provide a good value to the members. The only problem is that on some destinations there are no seats available even 331 days before. Then magically a couple of months before some seats appear. Another sweet spot for using AA miles is 60K for a 14 hour flight in the Etihad First Apartment from Australia to UAE. Incidentally, Etihad has a fantastic lounge in MEL, to avail oneself of, as well. Thomas, where do you see that price? It is 100k everywhere I look. I can’t find any business award saver to Puerto Rico at all any advice? Great resource for earning and using AA miles! You are putting in so much work so that our traveling is easier. I will tell friends who are frequent travelers about your site. This one could have used a little more polish I think. Surcharges for Indian Subcontinent are too high even for Economy. Howie, Could you please provide information on the booking experts you mention at the bottom of your post? The link just takes me to my AW account, but I see no specifics about this service – did I miss an announcement? Olga, we’ve got a team of folks that help you book award tickets. You fill out the linked form with your information and request. They’ll review what points/miles you have and make a suggestion on what would get the best value for your points and miles. If you find something mutually acceptable they’ll complete the booking for you (using your miles) and you’ll pay for the service at that point. They do the hard work of finding the best flights and getting the best value from your travel rewards. I’m trying to redeem AA miles for a flight to India. The site only shows AA and BA airlines and BA is out of question due to their high taxes and fees. AA shows me flight from DTW to BOM but nothing from BOM to DTW . Any help on how to book this flight ? Very timely info. My wife and I have unused AA miles and I was just starting to look into using them. Thanks so much for this info!! Thanks for pointing out the sweet spots. I didn’t even know about the miles discount for having the card. Are you saying you have to call to get it? I booked 2 award tickets while I had the card, they were 57,500 each, and I got 5750 miles off the first and 4250 off the second. So that is the 10% up to 10,000 miles bonus you get when redeeming as a cardholder. But are you saying the actual awards should also have been less than 57,500? Or would have been more if I didn’t have an AA card? I still probably would have cancelled the card if I’d known about these bonuses. Because there’s no way to earn more than 1x on most spend, and I can earn 1.25x AA miles with the SPG card. The $95 fee would only be worth it if I could take advantage of free bags. But it’s hard to get AA flights to my town, so I usually only fly them these days for International business class where I get free bags anyway. The awards could have been cheaper but it depends on the destination of the reduced mileage awards and if it was an eligible travel time. Yes, you need to call to book these. They waive the phone booking fee. Just booked a great flight using discounted miles. Remember to always look for discounted cities before shelling out cash!! is it possible to purchase a ticket and use AAdvantage miles for upgrades? And what would the miles needed be? This is the first time that I have read the blog and it saved me 20,000+ miles I was due to lose. Great information, keep it coming. Thanks for the info, I travel annually to California from the UK and had been thinking to use my miles for my standard trip, I didn’t really think about flying to Australia with Quantas from LAX till I read this. I’m on AA.com and Middle East business class is showing at 70k and First at 115k. How does one find these saver awards at 40-50k to Middle East in First (or even business)? Thanks!!! Olga, what origin and destination are you searching? From the US to the Middle East the prices you’re seeing are correct. From the Middle East to Asia is where you’ll see 40/50k in business/first. Thanks so much for explaining. I misunderstood your post and thought it was 50k miles from USA to Asia. Makes perfect sense now! Thanks for this. It’s good to know. I would apply for the AAdvantage Executive card, since the signup bonus is great. But it would be tough to meet the $7500 spending requirement. ba has to be avoided-all their charges make the miles useless. some good deals for asia though! You don’t need to avoid BA everywhere — in fact for intra-Europe flights, prices are reasonable. In Argentina, City Bank is not longer working so SantanderRio as the buyer of the local branch of City has agreed to continue with AA awards. i didnt actually know about short hops on aa only being 7500miles-useful in california! these flights canbe very expensive to purchase. alaska,ba dont show all the regional airport availabilty on their site though-just the major cities.. I from Uruguay, my miles expire in some days. Thanks so much for explaining this process and obtain some miles for change expiration date . Hi again. I have read the blog several days ago and follow the procedure to obtain miles. I not recive miles yet. I hope it work, due in a next day I lose my miles because expirate date. If it work is great information to mantein miles actve, keep it coming. I would recommend leaving a relevant comment on a relevant post. asking for miles by leaving a comment in this particular post is really not the best way to do it. Your comment has nothing to do with the content in this post. I’m only approving it so you don’t lose your miles. Please don’t leave comments on posts that are not relevant to that topic. With one of the Citi or Barclays American Airlines cards, reduced mileage awards are great. Just flew to a cross country destination roundtrip for only 17,500 miles. Had these tickets been purchased, the airfare was over $900. Take advantage of these discounted awards if available to/from your end destination. still have pending miles that could be used! will have to look into some of the reduced options…..
A very useful summary of some good redemptions. Any chance we could get an updated version of this article? As a EU resident with AA miles, curious if any new bargains have shown up. Hey Jeremy, we’ll certainly make an effort to add new AA opportunities. The biggest news recently is the ability to book Etihad tickets that connect in Abu Dhabi as a single award ticket. We’ll definitely be writing more about that. Let us know if there are any specific sweet spots we missed!